Miriama Galo was in tears as she was ordained a dea­coness for the Methodist Church in Fiji and Rotuma at Su­va’s Centenary Church on Wednes­day night. The 26-year-old from Naluwai in Naitasiri with maternal links to Naqalimare in Nadroga was one of the three deaconesses ordained. Ms Galo is the eldest in a family of five siblings. She graduated with a Diploma in Theology. Growing up Ms Galo al­ways wanted to become a teacher to help her family financially. However, she changed her mind when she realised her calling was to serve God. “When I told my parents that I wanted to become a deaconess they didn’t take me seriously because they thought I was joking,” Ms Galo said. Ms Galo said there were challeng­es she had to overcome to reach where she was today. “I am the first in my family to become a deaconess. I studied for three years before I was given my first posting,” she said. “I was posted to Nasinu Secondary School and being assigned to a big school was tough, but I knew that I could do it because I was called by God to serve him. 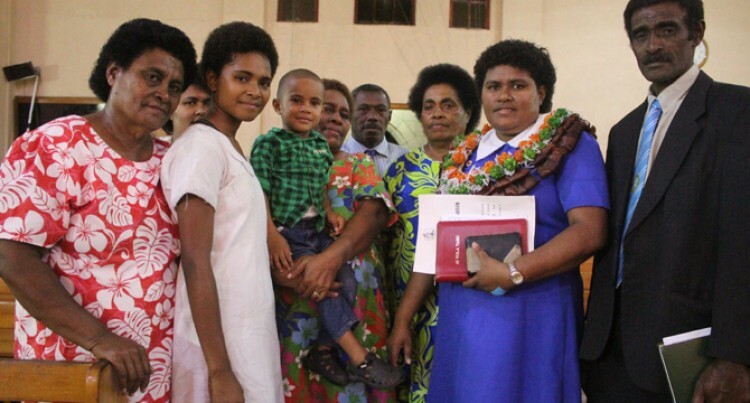 Deaconesses ordained on Wednes­day night were Kelera Uarua, Mere Finau and Ms Galo.